WhatsApp Windows is the Windows version for accessing and using WhatsApp on your PC. 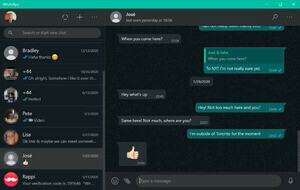 WhatsApp Windows allows you to message your friends and family for free. WhatsApp uses your phone's Internet connection to send messages so you can avoid SMS fees. For security reasons, you should also check out the WhatsApp Windows download at LO4D.com which includes virus and malware tests. Additional screenshots of this application download may be available, too. This file download is licensed as freeware for Windows 8, Windows 10.